The great horned owl has ear tufts and a head that is cat-like in appearance. The upperparts of the barred owl are brown with white mottling. Owls regurgitate the parts of their prey that cannot be digested in the form of pellets. What do you think the Barred Owl who spit up this pellet has been eating? Great horned owls range from very dark to lighter in color. Barred owls like this one tend to out-compete northern spotted owls. Owls are mainly birds of the night! They live in the magic and mystery of the darkness. J.K. Rowling gave owls a central place in the Harry Potter books, because they have always been associated with wizards and witches, as well as their association with wisdom, which was established in Roman times. It is the emblem of Minerva, the goddess of wisdom. Owls, then, are generally thought of as a symbol of knowledge and wisdom. Most people I know become quite excited when they see an owl. The Willapa National Wildlife Refuge and the Long Beach Peninsula in general is home to eight different owl species. The great horned owl is the largest of our night birds at 22 inches in length with a wingspan of 44 inches. The smallest owl is the northern pygmy-owl at just over half a foot in length with a wingspan of one foot. In between, in terms of size, are the barred owl, barn owl, long-eared owl, short-eared owl, western screech owl and the northern saw-whet owl. All of our owls are designated as uncommon except for the long-eared, which is considered rare in these parts. Nesting records exist for six of the species, the exceptions being the rare long-eared owl and the barred owl. The great horned owl and the barred owl are the owls we are most likely to see. 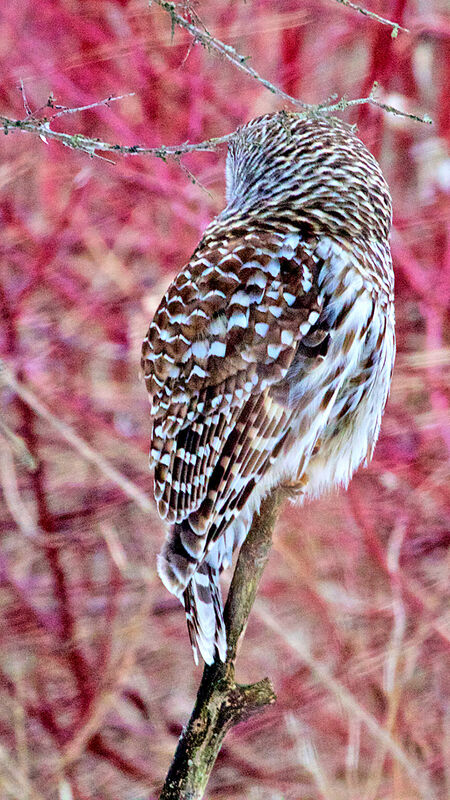 The barred owl is larger than a raven, and a little smaller than a goose. It is also just slightly smaller than the great horned. It is large and stocky with dark eyes and a yellow bill. It is buffy on the underside with dark streaks. The upperparts are brown with white mottling. The head is round and the bird does not have ear tufts. The great horned owl has ear tufts, is generally very dark overall but can be pale in color as well. Its head has a cat-like appearance. The barred owl is mainly nocturnal in its habits, but is also diurnal as it often hunts during the day. Its favorite food includes small mammals, birds, amphibians, reptiles and invertebrates. When hunting it mainly does so from a perch, but it can hunt on the wing as well. It will even catch fish from a perch or wade in shallow water to snag a fish or crayfish. (Great horned owls eat similar food, but don’t go fishing!) Small prey is usually swallowed whole, while larger prey is eaten in pieces. Like the northern shrike, extra food may be hung in a tree for a later snack or when hunting is poor. A barred owl, when perched, will sit tight providing excellent views at very close range, and it often swivels its head as it listens for prey. I recently witnessed this behavior on a trip to Ontario, Canada. It was perched and merrily swiveled its head as I watched with other birders who had gathered to see this magnificent creature. Upon hearing a vole, it swooped down from its perch, snagged the unsuspecting vole and flew off to a tree where it swallowed it whole! It was entertainment at its finest. Owling is a popular birding activity. Going on an owl prowl can be very exciting. In my opinion, daytime is best because most owls will be resting. All one has to know is the type of habitat that each owl species prefers. You then look for owl pellets on the ground under the trees. Owls regurgitate the indigestible parts of their prey after eating. It is a good clue as to the area in which an owl may be found. If you are lucky you may just find one. These birds of the night are fascinating and extremely exciting to see. You will definitely be hooked on birding if you see one! !